The Alpha Delta Pi Foundation is proud to award approximately 120 competitive academic scholarships each year with a total of more than $170,000 in scholarships. Award amounts vary up to $3,000, and scholarships are available for undergraduate, graduate, and continuing education study. Alpha Delta Pi members in good standing who have a 3.2 minimum cumulative GPA (unless otherwise noted) are encouraged to apply. The scholarship application for 2019-2020 is now open. Please contact the Foundation office at (404) 378-3164 or foundation@alphadeltapi.com if you have additional questions about the scholarship application process or if you are interested in funding a scholarship to benefit Alpha Delta Pi members. The National Panhellenic Conference (NPC) Foundation offers undergraduate and graduate scholarships for outstanding Panhellenic women. The Foundation for Fraternal Excellence (formerly North-American Interfraternity Conference Foundation) offers graduate and professional school fellowships to initiated members of NIC, NPC, NPHC, and PFA member fraternities and sororities. Your local alumnae Panhellenic organization may also offer scholarship opportunities (be sure to check both your hometown and school area). This scholarship was established by Alpha Delta Pi Sorority to commemorate its 150th Anniversary Fund in the year 2001 to provide scholarships to Alpha Delta Pi members in good standing for graduate or professional study who are pursuing health careers. Available income from this fund shall be used to provide scholarships to a member of Alpha Beta Chapter at the University of Iowa with preference to undergraduate members who exhibit financial need. If an undergraduate member is not eligible, the scholarship may then be awarded to a graduate member of Alpha Beta. This scholarship will be awarded for the first time for the 2019-2020 academic year. This scholarship is awarded annually to an undergraduate or graduate member in good standing of the Alpha Eta Chapter at Kansas State University, with first preference given to undergraduate members. This fund was established by several Alpha Omicron members to provide scholarships for Alpha Omicron initiates for graduate, undergraduate or continuing education classes. Available income from this fund shall be used to provide scholarships to a member pursuing a degree in music performance for her junior or senior year or graduate degree. This fund was established as a memorial to Angela J. Knight, a collegiate member of Eta Chapter, who was killed in an accident. The scholarship is to be awarded annually to an undergraduate member of Eta Chapter who has proven leadership qualities and outstanding academic achievement. Preference will be given to a rising senior. In the case of a tie between possible awardees, financial need shall be the deciding factor. This fund was established by former Grand Council and Foundation Board of Trustee member, Anne Veale Pogson. Income from the fund shall provide scholarships to an undergraduate member of any active Alpha Delta Pi Chapter within the state of Texas. The applicant should demonstrate financial need. This scholarship was established in memory of Berit Henriksen Carter, Beta Lambda—Brooklyn College of the City University of New York. Income from this fund shall provide scholarships to undergraduate members of Alpha Delta Pi in good standing attending an accredited college or university. This scholarship will be awarded annually to an undergraduate member in good standing of Beta Epsilon Chapter at the University of South Carolina. Income from this fund shall provide scholarships for an undergraduate member of Beta Psi Chapter who has completed 30 hours of credit at the time of the award. Criteria will include sorority service, campus participation and scholarship achievement, equally weighted. Available income from this fund will provide scholarships to an undergraduate member of Alpha Gamma Chapter at the University of Missouri, Columbia, with preference to a newly-initiated member. If a newly-initiated member does not apply or qualify, the award may be given to any undergraduate member in good standing of Alpha Gamma Chapter and or to an alumna member from Alpha Gamma Chapter pursuing graduate or continuing education if an undergraduate member does not apply or qualify. This scholarship is awarded to an Alpha Delta Pi alumna to acquire marketable skills or upgrade professional goals. Award restricted for tuition, fees, and books used in study at an accredited college or university OR in a formal, structured training program which provides a recognized form of certification; not for use at the doctoral level; applicants must have completed last degree or college enrollment at least five years ago. Income from the fund shall provide scholarships to an undergraduate member in good standing of the Eta Chapter at the University of Alabama or Iota Chapter at Florida State University who are pursuing a degree in arts and sciences. Should an undergraduate member not qualify who is pursuing a degree from these fields of study, any undergraduate member in good standing of Eta or Iota chapter may be selected. Should a member of Eta or Iota not apply or qualify, any undergraduate member in good standing attending an Alabama or Florida college or university may be selected. Available income from this fund shall be used to provide scholarships to an undergraduate or graduate member pursuing a degree in math, math education, or chemical engineering; preference to first-generation college students. Undergraduate applicants must have a 3.0 GPA or higher. This scholarship is for undergraduate members to be used during the junior or senior year. Income from the fund is to be used to provide scholarships to an undergraduate or graduate member of Alpha Psi Chapter at the University of Southern California for business study. Graduate members of Alpha Psi may be attending any accredited college or university or for continuing education in business at any location in the United States and Canada. Income from this fund is to be used for scholarships for undergraduate or graduate members from Beta Nu Chapter at the University of Georgia and the Delta Chapter at the University of Texas. The scholarship is to be awarded to members in good standing who are in their junior or senior year when receiving the award. This fund is to be used for awarding scholarships to a deserving member of Alpha Delta Pi pursuing graduate studies at any accredited institution. This fund was established as a memorial scholarship for Clara Duncan Smith. The fund shall be used to award a scholarship to undergraduate members in good standing of the Beta Eta Chapter at the University of Michigan. Income from the fund shall provide scholarships to an undergraduate member in good standing of the Epsilon Psi Chapter at Tennessee Technological University. Income from the fund shall provide scholarships to an undergraduate, graduate, or continuing education member in good standing of the Zeta Eta Chapter of Alpha Delta Pi. A cumulative GPA of 3.2 on a 4.0 scale must be met. If there are no eligible applicants from Zeta Eta, an alumna sister who has served as a Leadership Consultant for Alpha Delta Pi may be selected. This fund was established in 1994 by Alpha Psi Chapter, in memory of Deena Bartolo, a deceased sister of the chapter. The scholarship will be awarded to a rising junior or senior member of Alpha Psi chapter in good standing. The recipient should exemplify the ideals of Alpha Delta Pi with special emphasis on leadership, should have a favorable letter of recommendation from a Chapter Advisor, and demonstrate financial need. The income from this fund shall provide scholarships for an undergraduate member in good standing of Delta Alpha Chapter at Emory University. 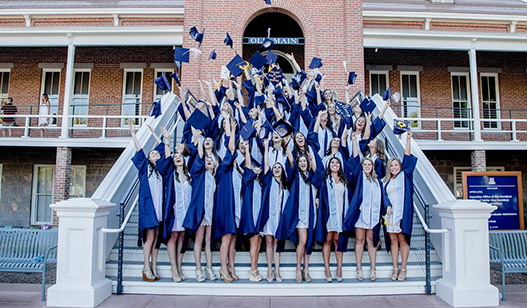 Available income from this fund will be awarded annually to an undergraduate member in good standing of Delta Gamma Chapter at the University of Arizona. If an undergraduate member is not eligible, the scholarship may then be awarded to a graduate member of Delta Gamma. Available income from this fund will be awarded annually to an undergraduate member in good standing of Delta Theta Chapter at Valdosta State University. If an undergraduate member is not eligible, the scholarship may then be awarded to a graduate member of Delta Theta. Available income from this fund will be awarded annually to an undergraduate member in good standing of Zeta Omicron Chapter at Georgia Institute of Technology or Zeta Nu Chapter at Clemson University. Established in 2007, income from the fund shall provide scholarships for undergraduate members in good standing of Epsilon Omega Chapter at Jacksonville University. Available income from this fund will provide scholarships to a member of Alpha Gamma Chapter at the University of Missouri, Columbia, who exhibits financial need. First preference is to undergraduate members, and open to alumnae from Alpha Gamma who exhibit financial need and are pursuing graduate or continuing education if an undergraduate member does not apply or qualify. Established in 2012, available income from this fund will be used to provide scholarships to undergraduate members in good standing from Eta chapter at the University of Alabama or Alpha Gamma chapter at the University of Missouri, Columbia. The scholarship shall be awarded to an undergraduate or graduate member of Beta Omega at Auburn University, with first preference to undergraduate members in good standing. Income from the fund shall provide scholarships to undergraduate members majoring in Liberal Arts, with a preference to music. Applicants from Beta Alpha at Indiana University should be given first consideration. If there are no applicants from Beta Alpha, the award may be given to a member from a chapter in Indiana or an Indiana resident. This fund was established as a memorial scholarship for Eileen Stinnett Riddle. Available income from this fund shall be used to award a scholarship to members in good standing of Chi Chapter at Wittenberg University. Established in April 2014 in loving memory of Elsie Heilman Consilio, a Beta Tau Sister, Akron Alumnae Association member, and House Corporation member. This fund commemorates more than 55 years of service to Alpha Delta Pi. The scholarship is to be awarded annually to an undergraduate member in good standing of Beta Tau Chapter at the University of Akron. If an undergraduate member is not eligible, the scholarship may then be awarded to a graduate member of Beta Tau chapter. In the event there are no qualified applicants in any given year, the Trustees may award the scholarship(s) to a member of Alpha Delta Pi in good standing. Available income from this fund will be awarded annually to a member in good standing of Epsilon Kappa Chapter of Troy University, with preference given to an undergraduate member. In the event that there are no qualified applicants for the scholarship in any given year, the Trustees may award the scholarship to any Alpha Delta Pi in good standing. Available income from this fund will be awarded annually to an undergraduate member in good standing of Epsilon Lambda Chapter at the University of South Florida. If an undergraduate member is not eligible, the scholarship may then be awarded to a graduate member of Epsilon Lambda. Available income from this fund will be awarded annually to an undergraduate member in good standing of Epsilon Nu Chapter at Ashland University. If an undergraduate member is not eligible, the scholarship may then be awarded to a graduate member of Epsilon Nu. Available income from this fund will be awarded annually to an undergraduate member in good standing of Epsilon Pi Chapter at the Georgia Southern University, with special consideration to sisters who demonstrate financial need. If an undergraduate member is not eligible, the scholarship may then be awarded to a graduate member of Epsilon Pi. If no applicants from Epsilon Pi are eligible or apply, the award may be granted to any member in good standing from a Georgia chapter. Available income from this fund will be awarded annually to an undergraduate member in good standing of Epsilon Tau Chapter at Middle Tennessee State University with special consideration to members who demonstrate financial need. If an undergraduate member is not eligible, the scholarship may then be awarded to a member of Epsilon Tau who is in a graduate or continuing education program. Available income from this fund will be awarded annually to an undergraduate member in good standing of Eta Upsilon Chapter at Wake Forest University, specifically for the purpose of participating in University sponsored study abroad programs. Should an undergraduate member not qualify who is participating in a study abroad program, any undergraduate member in good standing from the chapter may be selected to receive an academic scholarship. Should an undergraduate not apply or qualify, an alumna member in good standing of Eta Upsilon chapter who is pursuing a graduate program may be selected. Available income from this fund will be awarded annually to an undergraduate member in good standing of Eta Alpha Chapter at University of North Carolina, Wilmington. If no undergraduate member is eligible or applies, the award may be given to a member in good standing of Eta Alpha who is pursuing a graduate program. Available income from this fund will be awarded annually to an undergraduate member in good standing of Eta Epsilon Chapter at Miami University. If an undergraduate member is not eligible, the scholarship may then be awarded to a graduate member of Eta Epsilon. Available income from this fund will be awarded annually to an undergraduate member in good standing of Eta Lambda Chapter at Albright College who demonstrates financial need. If an undergraduate member who exhibits financial need is not eligible or applies, the scholarship may then be awarded to an undergraduate member. If no undergraduate member is eligible or applies, the award may be given to a member in good standing of Eta Lambda who is in a graduate program. The recipient of the annual scholarship awarded from the fund shall be a member in good standing of Eta Phi Chapter at Furman University. Preference should be given to undergraduate members. Should an undergraduate member not qualify, an alumna sister of Eta Phi chapter who is pursuing a graduate program may be selected. Available income from this fund will be awarded annually to an undergraduate member in good standing of Eta Xi Chapter at Presbyterian College. If an undergraduate member is not eligible or does not apply, the scholarship may then be awarded to an alumna member of Eta Xi who is pursuing a graduate program may be selected. Available income from this fund will be awarded annually to an undergraduate member in good standing of Eta Zeta chapter at the University of Southern Mississippi. If no undergraduate member is eligible or applies, the award may be given to a member in good standing of Eta Zeta who is pursuing a graduate program. Income from this fund shall provide scholarships for members of a West Virginia Chapter or West Virginia residents who are members of any Alpha Delta Pi Chapter. This fund was established as a memorial to Frances Johnson Murrah, a long-time elementary school teacher. Income from this fund shall be used to award scholarships to undergraduate members in good standing of the Lambda Chapter at Brenau University and the Zeta Omega Chapter at the University of Central Florida. The scholarship shall be awarded to an upcoming junior or senior of Zeta chapter. If there are no qualified applicants from Zeta Chapter or if Zeta chapter ceases to function, the scholarship may be awarded to any upcoming junior or senior in good standing of Alpha Delta Pi Sorority from the states of Texas or Missouri. Available income from this fund will be awarded annually to an undergraduate member in good standing of Gamma Chi Chapter at Texas Christian University. If an undergraduate member is not eligible, the scholarship may then be awarded to a graduate member of Gamma Chi. Available income from this fund shall be used to provide scholarships to a member of Gamma Delta Chapter at the University of Miami with preference to undergraduate members. If an undergraduate member is not eligible, the scholarship may then be awarded to a graduate member of Gamma Delta. Available income from this fund will be awarded annually to an undergraduate member in good standing of Gamma Mu Chapter at Missouri State University, who exhibits financial need. If an undergraduate member is not eligible, the scholarship may then be awarded to a graduate member of Gamma Mu chapter who exhibits financial need. Income from this fund shall provide scholarships for an undergraduate member in good standing of Alpha Delta Pi. The recipient of the scholarship awarded from the fund shall be an undergraduate or graduate member of Alpha Delta Pi who exhibits financial need. Established in memory of Heather Conti Westphal, a Zeta Psi alumna who passed away in a tragic accident in 2008. Income from the fund shall be used to provide scholarships for undergraduate members of Zeta Psi Chapter in her junior or senior year. Recipient must have an active role in the chapter as an officer or committee chair. Preference should be given to applicants who perform community service with the elderly. The recipient of the scholarship awarded from the fund shall be an undergraduate or graduate member of Beta Alpha chapter at Indiana University. In the event that there are no qualified applicants for the scholarship in any given year, the Trustees may use available income for education and leadership programs benefiting Beta Alpha. Income from the fund shall provide scholarships for undergraduate or graduate members of Omega Chapter at Louisiana State University, with first preference to undergraduates. If no member from Omega Chapter qualifies or applies, the award may be given to either an undergraduate or graduate member in good standing from Delta Chapter at the University of Texas, Austin. The recipient of the scholarship awarded from the fund shall be an undergraduate member of Beta Alpha Chapter. The recipient should demonstrate proven leadership qualities and be in need of financial assistance. The recipient of the scholarship awarded from the fund shall be an undergraduate or graduate member of Alpha Delta Pi. Income from the fund shall provide scholarships for undergraduate (including 5th year seniors still active in chapter) or graduate scholarships to members of Alpha Pi Chapter. The recipient should demonstrate a combination of need, merit and service to Alpha Delta Pi for undergraduate study at George Washington University or for graduate study at any accredited institution in the USA or abroad. Income from this fund shall provide scholarships to undergraduate members of Alpha Delta Pi attending an accredited college or university in either Georgia or Florida. Other criteria include clear financial need and active participation in extracurricular activities. Available income from this fund will be awarded annually to an undergraduate member in good standing of Iota Chapter at Florida State University. If an undergraduate member is not eligible, the scholarship may then be awarded to a graduate member of Iota. The award should be made to undergraduate members on the basis of academic accomplishment, campus/community involvement, and need. The recipient of the annual scholarship awarded from the fund shall be a member of Eta Pi Chapter at Virginia Polytechnic Institute and State University (Virginia Tech) or Gamma Kappa Chapter at West Virginia Wesleyan College. The recipient of the annual scholarship awarded from the fund shall be a member in good standing of Beta Nu Chapter at University of Georgia. Preference should be given to undergraduate members of Beta Nu chapter, with special consideration to those who demonstrate financial need. Should an undergraduate member not qualify, an alumna sister of Beta Nu chapter who is pursuing a graduate program may be selected. Income from this fund shall be used to provide scholarships for graduate members of Alpha Theta Chapter for study at the University of Washington or any other accredited university OR to undergraduate members of Alpha Theta Chapter at the University of Washington. Established by the Gamma Xi Chapter at the University of California, Santa Barbara, this scholarship is awarded annually to an undergraduate member in good standing of Gamma Xi Chapter. If an undergraduate member is not eligible, the scholarship may then be awarded to a graduate member of Gamma Xi. If there are no applicants from Gamma Xi chapter, the Trustees may award the scholarship(s) to a member of Alpha Delta Pi in good standing. Available income from this fund will provide scholarships to an undergraduate or graduate member of Alpha Delta Pi who is pursuing a degree in science, technology, engineering, or math related field. Income from these funds is to provide a scholarship for graduate or undergraduate study to alumnae or collegiate members in good standing of Beta Upsilon Chapter. First preference is given to Beta Upsilon graduate applicants majoring in any communications course of study at any accredited institution. Second preference is given Beta Upsilon graduate applicants for any course of study at any accredited institution. Third preference is given to Beta Upsilon undergraduate applicants for study at UNC Chapel Hill. Available income from this fund shall be used to provide scholarships to a member of Zeta Omega Chapter at the University of Central Florida with preference to undergraduate members. Should an undergraduate member not qualify, an alumna member in good standing of Zeta Omega chapter who is pursuing a graduate program may be selected. Income from this fund shall provide scholarships to junior class members of Kappa Chapter (for use during the senior year) who are in need of financial assistance to complete their education. Established in June 1984 by the Little Rock and Fayetteville Alumnae Associations and Delta Delta Chapter alumnae in honor of Karle Friar Smith, Lambda – Brenau University, a local Arkansas alumna who was instrumental in the start of Delta Delta Chapter in 1957. Available income from this fund will provide scholarships to undergraduate members of Delta Delta Chapter at the University of Arkansas. Available income from this fund will provide scholarships to a graduate member in good standing at any accredited university. This scholarship will be awarded annually to an undergraduate or graduate member in good standing of Tau Chapter who have demonstrated academic success and has/is serving the chapter in a position of leadership. First preference is given to junior or senior year undergraduate members. The recipient of the scholarship awarded from the fund shall be an undergraduate member of Alpha Delta Pi who exhibits financial need. Should an undergraduate member not qualify, an alumna member who is pursuing a graduate degree may receive the award. In the event that there are no applicants exhibiting financial need, the Alpha Delta Pi Foundation trustees may award the scholarship(s) to any member of Alpha Delta Pi in good standing. Income from the fund shall provide scholarships to a member of Alpha Delta pi who is a rising senior. Selection should be based on scholarship need, service to Alpha Delta Pi, and personal goals. Available income from this fund shall be used to provide scholarships to a member of Beta Nu Chapter at the University of Georgia, Lambda Chapter at Brenau University, or Kappa Chapter at Samford University, with preference to undergraduate members. Should an undergraduate member not qualify, an alumna sister of Beta Nu, Kappa, or Lambda chapter who is pursuing a graduate program may be selected. Income from this fund shall provide a scholarship for an undergraduate member of Alpha Delta Pi in her junior or senior year who will be serving during the year of the award as a chapter officer. The scholarship shall be awarded to an undergraduate or graduate member of Alpha Theta Chapter at the University of Washington, Upsilon Chapter at Washington State University, or Beta Kappa Chapter at the University of British Columbia who exhibits financial need. Available income from this fund will be awarded annually to an undergraduate member in good standing of Alpha Chi Chapter at University of California, Los Angeles. If an undergraduate member is not eligible, the scholarship may then be awarded to a graduate member of Alpha Chi. In the event that there are no qualified applicants for the scholarship in any given year, the Trustees may award the scholarship(s) to a member of Alpha Delta Pi in good standing. Income from this fund shall provide undergraduate scholarships to a member in her junior or senior year on the basis of GPA, as well as proven leadership ability and service to the Sorority and community. Available income from this fund will provide scholarships to a member of Zeta Lambda Chapter at Texas A&M University who exhibits financial need. First preference is to undergraduate members, and open to alumnae from Zeta Lambda who exhibit financial need and are pursuing graduate or continuing education if an undergraduate member does not apply or qualify. Income from the fund shall provide scholarships for undergraduate members of Alpha Delta Pi exhibiting financial need. Recipient must be a rising junior or senior year, and should demonstrate academic excellence, service to Alpha Delta Pi, the college/university, and the community. Scholarships from this fund are to be awarded for graduate school or continuing education to any Alpha Delta Pi member in good standing. Income from this fund shall provide scholarships for undergraduate members of Alpha Delta Pi majoring in journalism for use in their junior or senior year OR for graduate members in an accredited journalism program on the basis of academic excellence, financial need and service. Available income from this fund will be awarded annually to a member in good standing of Epsilon Xi Chapter at Northern Arizona University pursuing undergraduate, graduate, or continuing education studies. Established in October 2008 by the Memphis Area Alumnae Association to be used for awarding undergraduate scholarships to members in good standing of Gamma Eta chapter at the University of Memphis. Income from the fund shall be used to provide scholarships to undergraduate members of Missouri chapters or undergraduate members of any chapter who graduated from a Missouri high school. This fund was established by Gamma Iota Chapter in honor of Myrtle McLemore Anderson’s dedicated service as Gamma Iota Chapter Advisor and House Corporation Chairman and national service in the finance area. The scholarship is restricted to members of Gamma Iota Chapter at the University of Florida in their junior or senior year demonstrating active participation in chapter activities. Scholarships from the income of this fund shall provide scholarships to undergraduate members of Eta Chapter at the University of Alabama. The income from this fund shall be used for awarding a scholarship(s) annually to undergraduate members of North Carolina collegiate chapters. Priority is given to junior and senior members who are in financial need in order to remain in college. Other considerations are GPA and active participation in campus and/or chapter activities or leadership. The scholarship shall be awarded to an undergraduate member of Beta Omega at Auburn University, with first preference to members who are currently serving or have served as a chapter officer, maintain a 3.0 minimum grade point average, and are recommended by the chapter’s executive board. Established by Michelle Vaughn, Pi—Iowa State University in honor her mother, Peggy Woods Vaughn. This scholarship is to be awarded annually to an undergraduate or graduate member in good standing of Alpha Delta Pi who was initiated at Alpha Gamma chapter at University of Missouri, Columbia. Should a member of Alpha Gamma chapter not apply or qualify, the Alpha Delta Pi Foundation trustees may award the scholarship(s) to any member of Alpha Delta Pi in good standing. Income from this fund shall be used to provide scholarships for members of Pi Chapter, for use in the senior year, who have demonstrated outstanding academic achievement and proven leadership qualities. Financial need shall be considered in case of a tie. To be used for the awarding of a scholarship to a member in good standing of Alpha Delta Pi for undergraduate or graduate study at any accredited university pursuing a degree in math, science, or technology related field. A cumulative GPA of 3.2 on a 4.0 scale must be met. Available income from this fund will be awarded annually to an undergraduate member in good standing of Rho Chapter at Boston University including sisters who have affiliated with the chapter, and have a minimum of 3.2 cumulative GPA. If an undergraduate member is not eligible, the scholarship may then be awarded to an alumna member of Rho who is pursuing graduate school or continuing education courses. In the event that there are no qualified applicants for the scholarship in any given year, the Trustees may award the scholarship(s) to a member of Alpha Delta Pi in good standing. To be used for the awarding of a scholarship (or scholarships) to a member in good standing of Alpha Delta Pi for undergraduate or graduate study at any accredited university, or for continuing education study at any location in the United States or Canada. This fund shall be awarded to an undergraduate member of Beta Upsilon Chapter at the University of North Carolina, Chapel Hill in her junior or senior year. Additionally, the recipient should demonstrate leadership qualities and demonstrate financial need. Available income from this fund will be awarded annually to an undergraduate member of Sigma Chapter at the University of Illinois. If an undergraduate member is not eligible, the scholarship may then be awarded to a graduate member of Sigma Chapter. Available income from this fund will be awarded annually to an undergraduate member in good standing of Omicron Chapter at Duke University. If an undergraduate member is not eligible, the scholarship may then be awarded to a graduate member of Omicron. If there are no applicants from Omicron chapter, the Trustees may award the scholarship(s) to a member of Alpha Delta Pi in good standing. Available income from this fund will be awarded annually to an undergraduate member in good standing of Theta Beta Chapter at Coastal Carolina University. If an undergraduate member is not eligible, the scholarship may then be awarded to a graduate member of Theta Beta. In the event that there are no qualified applicants for the scholarship any member attending a South Carolina chapter may be selected. If there are no applicants from Theta Beta or South Carolina, the Trustees may award the scholarship to any member of Alpha Delta Pi in good standing. The recipient of the annual scholarship awarded from the fund shall be a member of Theta Delta Chapter at University of Delaware. Preference should be given to undergraduate members of Theta Delta Chapter, with special consideration to those who demonstrate financial need. Should an undergraduate member not qualify, an alumna sister of Theta Delta chapter who is pursuing a graduate program may be selected. Preference should be given to women who demonstrate financial need. Available income from this fund will be awarded annually to an undergraduate member in good standing of Theta Omicron Chapter at James Madison University, who exhibits financial need. If an undergraduate member is not eligible, the scholarship may then be awarded to a graduate member of Theta Omicron, with preference given to a member who exhibits financial need. If there are no applicants from Theta Omicron Chapter, the Trustees may award the scholarship to any member of Alpha Delta Pi in good standing. Available income from this fund will be awarded annually to an undergraduate member in good standing of Theta Zeta Chapter at Washington & Lee University, with first preference to those who demonstrate financial need. If an undergraduate member is not eligible, the scholarship may then be awarded to a graduate member of Theta Zeta, with preference to those who demonstrate financial need. In the event that there are no qualified applicants for the scholarship, the Trustees may award the scholarship(s) to a member of Alpha Delta Pi in good standing. Income from this fund shall be used for scholarships for members of Alpha Delta Pi who are currently serving as international elected or appointed officers, committee chairs, committee members or chapter advisory board members and who intend to continue service during the term of the award. The award will be made for graduate or continuing education study at an accredited college or university. Per the instruction of Mrs. Cooney’s last will and testament, income from the fund can be used to provide scholarships for graduate, undergraduate and continuing education study for members of Alpha Delta Pi in good standing. Available income from this fund will be awarded annually to an undergraduate member in good standing of Xi Chapter at Ohio University. If an undergraduate member is not eligible, the scholarship may then be awarded to a graduate member of Xi. This scholarship shall be awarded to a an undergraduate member of Zeta Chi Chapter at Baylor University. The recipient should have a cumulative GPA of 3.0 or better on a 4.0 scale and shall obtain a letter of recommendation from any professor or faculty member at Baylor University who is familiar with the applicant’s accomplishments with special emphasis on leadership and academic performance. Preference will be given to applicants with demonstrated financial needs. Available income from this fund will be awarded annually to a member of Zeta Gamma Chapter at the University of North Carolina Charlotte, with preference to undergraduate members. If an undergraduate member is not eligible, the scholarship may then be awarded to a graduate member of Zeta Gamma. Available income from this fund will be awarded annually to an undergraduate member in good standing of Zeta Iota Chapter. If an undergraduate member is not eligible, the scholarship may then be awarded to a graduate member of Zeta Iota. In the event that there are no qualified applicants for the scholarship any member in good standing from a Georgia chapter may be selected. If there are no applicants from Zeta Iota or a Georgia chapter, the Trustees may award the scholarship(s) to a member of Alpha Delta Pi in good standing. Available income from this fund will be awarded annually to an undergraduate member in good standing of Zeta Lambda Chapter at Texas A&M University, who exhibits financial need. If an undergraduate member is not eligible, the scholarship may then be awarded to a graduate member of Zeta Lambda. If there are no applicants from Zeta Lambda Chapter, the Trustees may award the scholarship to any member of Alpha Delta Pi in good standing from a Texas chapter. In the event that there are no applicants from Zeta Lambda or the state of Texas, the Alpha Delta Pi Foundation trustees may award the scholarship(s) to any member of Alpha Delta Pi in good standing. Available income from this fund will be awarded annually to an undergraduate member in good standing of Zeta Mu Chapter at Appalachian State University. If there are no undergraduate members, the award may be given to a graduate member of Zeta Mu chapter. Available income from this fund will be awarded annually to an undergraduate member in good standing of Zeta Nu Chapter of Clemson University. If there are no undergraduate members, the award may be given to a graduate member of Zeta Nu chapter. Established by the Zeta Omega Chapter House Corporation at the University of Central Florida, this scholarship is awarded annually to an undergraduate member of Zeta Omega Chapter. If there are no undergraduate members, the award may be given to a graduate member of Zeta Omega chapter. Available income from this fund will be awarded annually to an undergraduate member in good standing of Zeta Omicron Chapter of Georgia Institute of Technology. If an undergraduate member does not qualify or apply, the scholarship may then be awarded to a graduate member of Zeta Omicron chapter. Available income from this fund will be awarded annually to an undergraduate member in good standing of Zeta Pi Chapter of the University of San Diego. If an undergraduate member does not qualify or apply, the scholarship may then be awarded to a graduate member of Zeta Pi chapter. Available income from this fund will be awarded annually to a member of Zeta Rho at Vanderbilt University with preference to undergraduate members. If an undergraduate member does not qualify or apply, the scholarship may then be awarded to a graduate member of Zeta Rho chapter. Available income from this fund will be awarded annually to an undergraduate member of Zeta Sigma Chapter at the College of Charleston. If an undergraduate member is not eligible, the scholarship may then be awarded to a graduate member of Zeta Sigma. Available income from this fund will be awarded annually to an undergraduate member in good standing of Zeta Tau Chapter at Winthrop University. If an undergraduate member is not eligible, the scholarship may then be awarded to a graduate member of Zeta Tau. Available income from this fund will be awarded annually to an undergraduate member of Zeta Upsilon Chapter at Oakland University. If an undergraduate member is not eligible, the scholarship may then be awarded to a graduate member of Zeta Upsilon.